The Italian African Police (Italian: Polizia dell'Africa Italiana, or PAI), was the Police of "Italian Africa" from 1 June 1936 and 1 December 1941. After the end of the war in Ethiopia in late 1936 early 1937, the Corps of "Polizia Coloniale" (Colonial Police) was created to be the police in the colonies in Africa (Libya) and it started issuing its own license plates in March 1938. 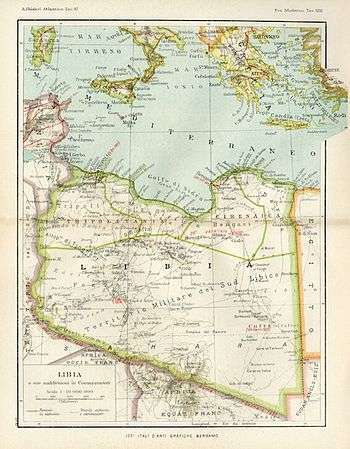 The unit was created as a result of the reorganization of public safety units operating in Italian North Africa (Africa Settentrionale Italiana, or ASI) and to later garrison Ethiopia and the rest of Italian East Africa (Africa Orientale Italiana, or AOI). In 1939 it became "Polizia dell'Africa Italiana" (Police of Italian Africa), or P.A.I. and received armoured cars, light tanks (tankettes), motorcycles, motor-tricycles and cars, in totaling they were about 1,000 vehicles and as many motorcycles. When the Italian empire fell, the P.A.I. forces were moved in Rome with duties of public order until the liberation of the city on 4 June 1944 when the corps was disbanded and all its vehicles and equipment were taken by the police (Polizia). 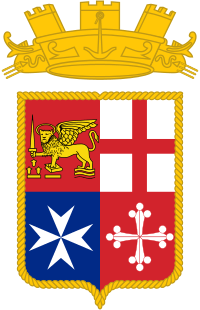 The new corps was initially subordinated to the Ministry of the Colonies and then to the "Ministry of Italian Africa" (then held by Alessandro Lessona). This was the first case in Italy of an Armed Force put under a civil ministry. The PAI had a reputation for discipline and high training levels, and for being provided with good equipment. Even after the collapse of AOI, the PAI were able to keep the peace in Addis Ababa, the capital of Ethiopia. 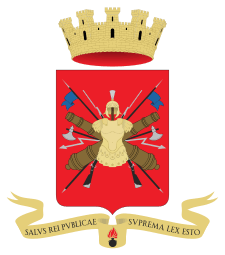 The Royal Decree of 10 June 1937, n. 1211, established its organic regulations, for which it was a militarily organized civil body and making it part of the Italian Armed Forces, with functions of political, judicial and administrative police. The force was a racially mixed organization, made up of Italian agents and many native askaris. It was located in police headquarters of major cities like Tripoli, Benghazi, Asmara, Addis Ababa, Mogadishu, Gondar, or in small commissariats otherwhere. The PAI training school was in Tivoli. Part of the PAI personnel was mounted on Moto Guzzi motorcycles, with many armed with the Beretta M1938A 9 mm sub-machine gun. At the outbreak of World War II the PAI had 7,672 men, of which 6,345 were in AOI (Eritrea, Ethiopia and Italian Somalia) and 1,327 were in ASI (Italian Libya). The bulk of the force consisted of indigenous personnel who were trained and equipped to the same standard as Italian personnel. There were 5,142 indigenous personnel, 4,414 from AOI and 732 from ASI. The PAI fought bravely during World War II in the Italian colonies and in Italy. During World War II, the PAI fought as a combat unit alongside the Italian Army. For the garrison of the Libyan littoral way, at the outbreak of the conflict two companies on motorcycles and an armored car were assigned to the Exploring Unit of the CAM (Corpo armato di manovra) Battalion "Romolo Gessi". They had little fortune since, after a sudden enemy attack, numerous soldiers were hit by friendly fire from German aircraft. The battalion repaired in Tripolitania and was converted into a mixed company. Several units participated in war actions, at Tripoli, Benghazi, Barce, but the details regarding effective employment are insufficient. After the Armistice of Cassibile, the evening of 8 September 1943 the PAI participated to the defense of Rome engaging the first conflict with the Germans at Mezzocammino, near Castelfusano, with troops of Carabinieri, in aid to a garrison of Grenadiers of Sardinia. On the other side of Rome, at the same time, some troops protected the escape of the King Victor Emmanuel III along the via Tiburtina, the King and the Prime Minister of Italy Pietro Badoglio; once accomplished the task they were sent along the Via Laurentina. On 9 September the PAIRS, with the Bersaglieri and cadet police officers, forced for a while the Germans to retreat from the Magliana area; however, after some hours they had in turn to withdraw in direction of Fort Ostiense, which was later stormed by the Germans. The commander and founder of the PAI, General Marraffa, was captured by the Nazis and deported to the Dachau concentration camp, where he died. 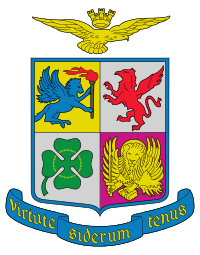 Later, there was a reorganization attempt in northern Italy, with the opening of a PAI school at Busto Arsizio in the autumn of 1943. However, the troops were absorbed by the Republican Police Force of the Italian Social Republic, and finally by the Republican National Guard. Ranks were as for the Italian Army with enlisted rank being the older style larger pattern of red chevrons worn on both upper sleeves. Personnel wore the standard Italian khaki tropical uniform but with a blue aiguilette fixed from the right shoulder strap to the second button down the front of his tunic. Personnel also wore a small gold PAI badge on the front of their headgear and small brass fasces pinned directly to their collars. Motorcycle mounted personnel wore a brown leather crash helmet, light khaki breeches with brown leather boots and leather leggings to protect the lower legs. "Le Uniformi dell'AOI (Somalia 1889-1941)" Priero Crocaini and Andrea Viotti. 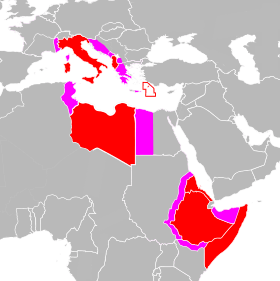 The Italian empire before WWII is shown in red. Pink areas were annexed/occupied for various periods between 1940 and 1943. Italian concessions and forts in China are not shown.